Tekeny Ghemor (as seen in S3 Second Skin and played by Lawrence Pressman) visits DS9 and Kira to reestablish their relationship after the Cardassian regime allied itself with the Dominion. 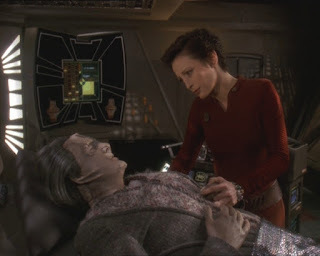 Kira is hoping that as a known dissident he would be willing to be the voice of an off world Cardassian government in exile but he reveals he is close to death. He tells Kira that a Cardassian custom allows him to offer up all his secrets and knowledge to a family member who could then use that information and he considers Kira to be his daughter and so she agrees. Gul Dukat demands that Tekeny is returned to Cardassia but after Sisko brushes him off he turns up in a Dominion Battlecruiser along with the latest version of Weyoun and attempts to bribe Tekeny to return and what that fails well he tries to assassinate him. Kira learns that during the occupation the Tekeny was assigned to the unit that destroyed a religious order and she refuses to see him although her feelings towards him are mixed with her own memories of her father's death. Tekeny finally passes and Kira buries him alongside her father while Dukat states that he will return and proclaim that Tekeny embraced the Dominion. DS9 at it's best excelled in character studies and building whole episodes around individuals, not a common theme in Trek as a whole which is perhaps why TNG and Voyager did better in the ratings. In this story we get a history of Kira and her relationship to her real father and one she considers worthy of the same respect. In the flashbacks we see that the occupation has taken it's toll on a young Kira and she has never truly addressed the issue of putting revenge ahead of compassion. It was fitting that she got a chance to make amends and serve her people and the Federation as a bonus. It was a telling opening scene between Kira, Dax, Worf and Tekeny in regards to how DS9 delivers Trek, there were no humans present and none where needed, these characters have been built with care and precision to reflect everything the viewer needs to understand them. I was and always have been curious why the station never had a docking port/pylon more suitable for higher ranking or vip visitors but that's not really important I guess. I did find it vastly amusing that Kira also had her own section within the Cardassian central archives, probably different from Dukat's personal files which given his history may include some candid photos, he does like the Bajoran women. 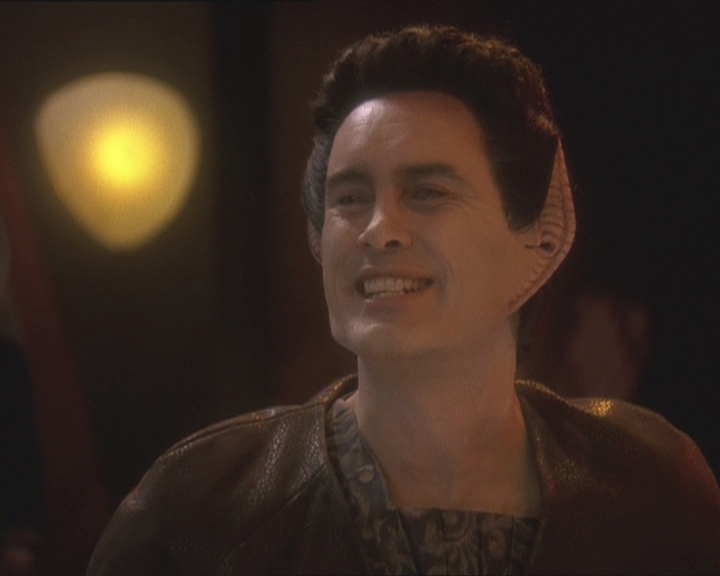 Putting aside the central theme of Kira and her relationship with two particular men in her life we did some good stuff from Dukat and Weyoun 5 was as ever brilliant, once again Jeffrey Combs excels with a few brief comments and expressions. Weyoun's utter fascination as Sisko and Dukat traded barbs and the attempted assassination plot was the perfect counterbalance to what was an emotion heavy episode. Ties of Blood and Water was directed by Avery Brooks and since this story is all about Kira it was ideal for the lead actor to take himself out of the limelight although he did have fun scenes with Ducat as you would expect. Nana really did herself proud with her portrayal of both the Kira we know and all younger self who was being pulled in many directions during the occupation. Her admission that sje left her father to die alone was mostly due to her own emotional weakness showed how far she had come and may explain her more volatile nature but in returning to Tekeny she took a giant step to addressing a flaw in her character. 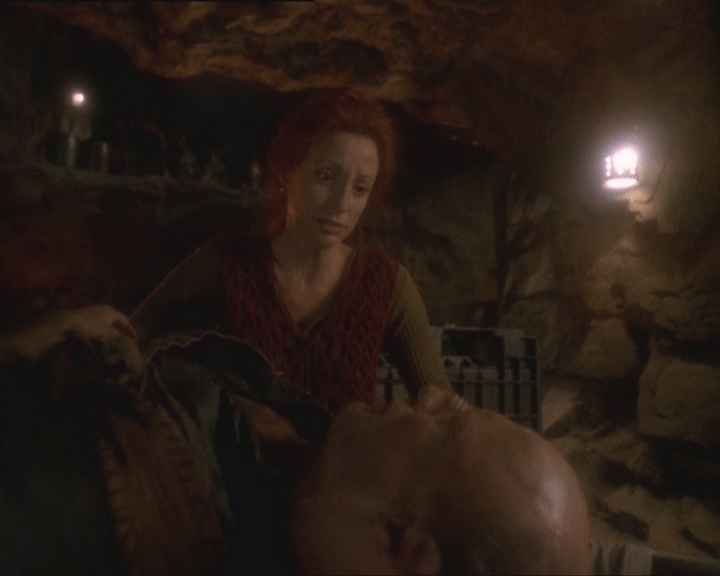 The final scene of his grace next to her father's was glorious and also showed how Bajor was being brought back to life, what was a piece of dirt and rock was now an area of beauty and tranquility.